Char has been a indie horror film reviewer for the last three and half years. She has conducted over a 100 interview/podcasts with the men and women of indie horror films and with horror authors too. Most recently, she invited 15 horror authors to her online radio show Charred Remains for a Night of Storytellers. The show was a hit and has started a summer series. Each author was given an allotment of time to perform a reading from their current/upcoming novel. Char’s love for writing began the moment her kindergarten teacher put a pencil in her hand and taught her to write her name, by the first grade, she was writing tall tales. All through school she wrote stories and enjoyed writing poetry. Char was first published in the 2012 anthology Dark Light published by Crushing Hearts and Black Butterflies. She was also featured in the follow-up anthology Dark Light 2. Go to www.blogtalkradio.com/charred_remains for more information. Ogres of the Hickory Cottage is a serialized story she created was based on her experiences managing her family’s used bookstore. She had created a tale involving ogres living in the attic to scare children whose sole intent was to trash her bookstore. 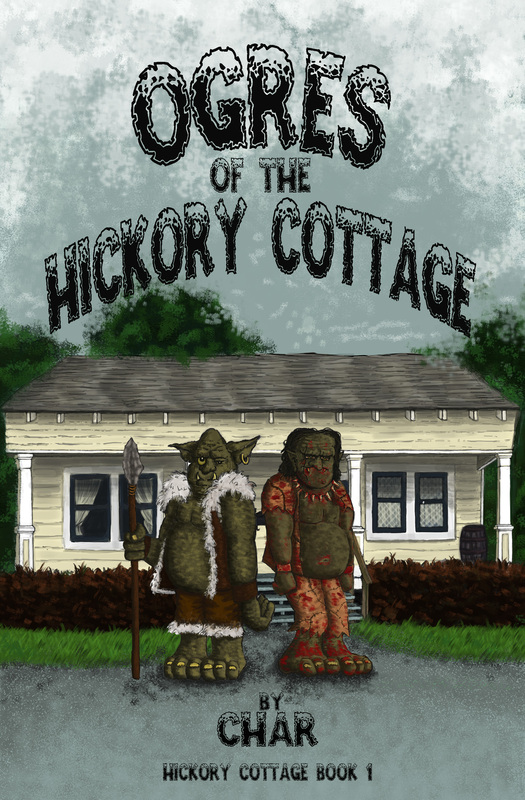 The end result has become a serial story, Ogres of the Hickory Cottage. The Hickory Cottage Book Exchange has begun revising their policy in the hiring of Ogres Boris and Lon. Since the two Ogres started working at the Ponchatoula used bookstore, three children and ten cats have been reported missing. Book seller Charley is caught in a maze of books, murder and betrayal. To stay one step ahead of the law, she must betray two friends in order to protect her employees Boris and Lon, which happen to be two ogres who have a magical connection to Charley are at the center of a maelstrom involving murder and magic. Q. Your new story “Ogres of Hickory Cottage” features a family bookstore, Hickory Cottage Book Exchange. How do you think local family stores like that are doing in the age of the eBook? Do modern challenges to the local bookstore work their way into your story? A: Very good question. The reason the original Hickory Cottage Book Exchange (yes it is based on a real store that I ran for 12 years) closed October 2013 because we could not compete with Amazon, Kindles and Nooks. My customer base took in all ages with a whopping higher percentage of retirees. The ease of downloading their books won out over getting in their cars or depending on family/friends to bring them to our bookstore. Basically the convenience of downloading killed my business. It is a very sad day when the local bookstore closes. I still see former customers who did belong to the “Downloading Books” Club and they always say the same thing, “So sorry to see that you closed” or “Since have closed, I have to go to the library and I am forever on a waiting list for the new books” and so on. It broke my heart to have to close a business that was over 30 years old. My father bought in 2001 one week after 9-11 and to see it close just 12 years later was rough. That downloading killed it is a tough pill to swallow seeing how my first book is only available in e-book form. This will surprise many of my customers, especially those who do not download, but the way of publishing and books is going…no, I take that back, it has gone the way of e-books and I can either adapt or forget it. I want to share my stories for years to come, so I have adapted. I hope that my former customers do not see this as a sell-out but a way to share 12 years of fun times and crazy times that I spent serving them at the Hickory Cottage Book Exchange. Q. How did your personal experience working in your family bookstore help inspire your writing? A: Oh boy, working for the public inspired all sorts of ideas and storylines. The customer is always right and even when you know they are wrong, they are right and some left a lasting impression so much that they are featured in my stories. Some characters are obvious if that person is reading them and others share certain characteristics of customers who came to my store. I am a people watcher and I pick up things that others would overlook. I may have looked like at times, I was shelving books and just blending in with the maze of books, but I was listening and absorbing so many stories that gave birth to notebooks full of ideas to incorporate into my stories. I have my customers to thank for many things one is sharing their stories with me. Q. Your book is about children, but do you think it is appropriate for children? What age group is it targeted at? A. Oh, I wouldn’t say my story was all about children. There are many things going on at once: missing children, decrease in the city’s cat population, magic, ogres working at the local used bookstore, love, profiling, and self image issues to name just a few. Children are a part of the story yes in a horrific way. I would say age 16 to adult. This is a fairy tale of sorts but it is an adult fairy tale and not one I would want a child to read. If I could stress one thing to readers, the cover is cute, but it is not a fluffy children’s fairy tale. It is a dark fantasy. I used the category of urban fantasy because the characters are coexisting with Ogres. They are not imaginary, they are real. And as the story moves along, other entities will pop up: ghosts, witches and in the next book a tree spirit. The story is based on my experiences working in the Hickory Cottage Book Exchange aside from tree spirits and ogres which are fiction some things like witches and ghosts actually happened in my store. So no, I would not say this is a children’s serial, but more for the mature minded. Q. Do you think kids love scary stories as much as adults? What were some of your favorite scary kid’s stories growing up? A. I can’t speak for all kids, but I loved scary stories. I was a voracious reader as a child and still am. I discovered Bruce Colville in elementary school and loved his stories. By junior high I was reading Stephen King, Dean Koontz, Ray Bradbury, R.L. Stine, Christopher Pike, John Saul, V.C. Andrews, and Dan Simmons, which could not be found in the children’s section. I read what I could get my eyes on and if it happened to be adult horror, and I could get a copy, I read it. Horror was my favorite. I loved the Flowers in the Attic series by V.C. Andrews. Q. You have a lot of fiction and non-fiction podcasting experience – what can you tell us about that? A. Podcasting I started in 2011 when I was writing for a horror site, http://www.horrorphilia.com. It was a means to meet the filmmakers of Indie horror films and I seemed to have a knack for setting folks at ease during an interview. I was schooled by several people in the indie horror community and once I was finally able to record and edit my own shows; I was off and talking. I like meeting people and talking about their careers, goals, and inspirations. Podcasting gives entertainers, authors, musicians a platform to get their messages out to those fans who love their particular line of work. I have done over a 100 podcasts and loved each and every experience. I know once a film, novel, music CD is made that the easy part is over now the artist has to market and drum up interest and through the use of social media is not enough. I firmly believe that bloggers and podcasters are the way to go in getting an artist’s name out there. It’s not enough to build a brand/image/persona, one has to break out of their comfort zone and do whatever they can to draw attention to their product. I have been told that my promotions helped many filmmakers get their name and film’s name out there by my writing reviews and just talking about them on my shows. I think that is just peachy keen. I love promoting and do it every time I log onto the Internet. Pay it forward for the next person. Someone did it for me and I try to every day to pass that on by paying it forward to someone else. Q. Is there anything you would like to tell our readers that we haven’t covered yet? A. For the last four years, I have devoted many hours to watching indie horror films and reading horror novels to write reviews on them. I have launched several podcast series that have all be successful. Through blogging and podcasting, I have helped many people get their names and films noticed by other blogger reviewers and fans that otherwise may not have ever heard of them. I can look back on all that I have accomplished and smile. Now, that my bookstore is closed and I am not working, I find myself with a lot of time on my hands. I look at my file cabinet full of notebooks with ideas and stories and smile. I have countless stories to tell and the hardest part is deciding on which story I want to write. I am retiring from writing reviews and look forward to going into July knowing for the first time in a long time, I am writing something that I created. I will write a few reviews here and there, but from this day forward I have Ogres to write about and coming behind them are more mystery-suspense, erotica, and a teen serial dealing with TP House Rolling. 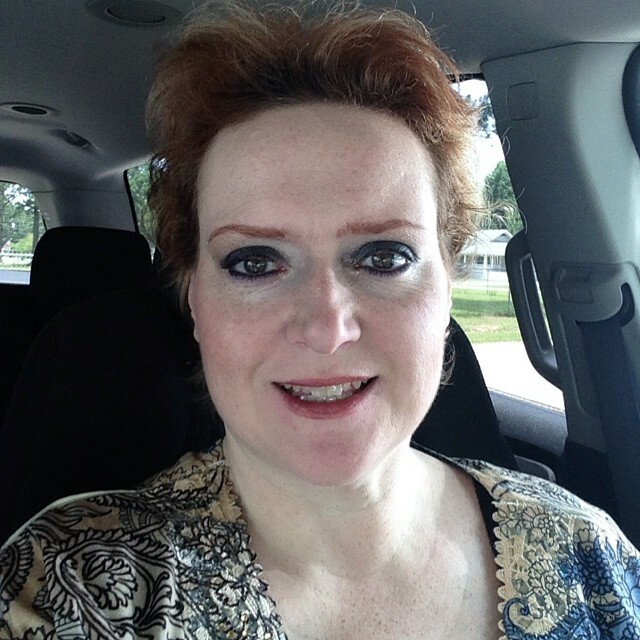 I look forward to meeting new authors and connecting with readers and yes, I will continue podcasting for as long as anyone wants to listen. Thank you, Sumiko for giving me this time, to share a little about myself and my writing. Shout out to the Facebook group “Ladies of Horror”, I have met some wonderful ladies in there and just want to say thank you for being welcoming and helpful. I appreciate your guidance and friendship. ~ by Sumiko Saulson on July 4, 2014. Great interview. What she says about indie book stores is sad. I know one downtown where I live where the owner says that no one under the age of 40 comes in anymore. I think eventually the only people buying paper books are collectors. That’s terrible. Bookstores are still the physical locations of book signings and book tours, but without the indies, I think we’d only see those for major authors.